DC Universe Classics has come to its end, and the DC All-Stars line that was (sort of) meant to replace it was cancelled before it even started. But we can still get our 6" DC fix thanks to Mattel's pioneering toy subscription plan. After accidentally inhaling vapors of a radioactive liquid, Jay Garrick gained incredible powers that included enhanced reflexes and the ability to run at light speed. 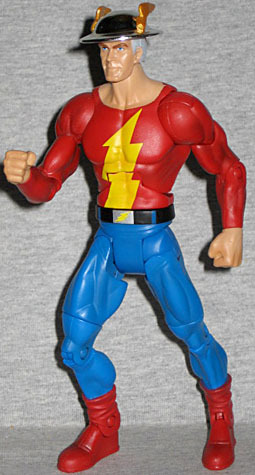 Wearing a red shirt emblazoned with a lightning bolt, Garrick battled evil as The Flash, eventually becoming a founding member of The Justice Society of America and fighting in World War II as a part of the All-Star Squadron. Garrick was forced into suspended animation by the evil Fiddler, but his heroics were an inspiration to many, including Barry Allen, who became the second incarnation of The Flash. Allen eventually rescued his hero, bringing him out of retirement and into the 21st Century. Jay Garrick's origin just keeps getting more fantastic, and yet more plausible. Radioactive liquid? Yeah, okay. It used to be the vapors from heavy water, which is slightly toxic but not inherently radioactive. And in his first appearance, he took a cigarette break and knocked over a beaker of hard water, which is the same stuff that causes a crusty buildup on your taps. So I guess if you smoke in the shower, you get superpowers? Try this at home, kids! 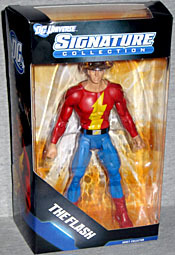 The subscription figures use the same bodies as their DCUC forbears, and Flash gets the "small" male body, which is still more toned and muscular than a guy who was in college in 1938 should reasonably be - but then, all those Golden Age guys have various excuses for why they haven't crumbled into dust yet Extra lives, time travel, magic... taken in that light, the time Jay spent in suspended animation is probably enough of a reason. The figure does get a few pieces to set him apart from the crowd, however: there's a separate belt at the waist, and he has short booties. 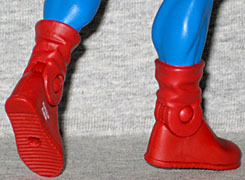 He uses the same feet as the rest of the Flashes, so there are treads on the soles. And, of course, the head. Ah, the head! The Horsemen did a lovely job. Even as an elder statesman of the superhero world, Jay was never really a dour character, and he's been sculpted with a lopsided smirk that makes him look like he's having fun. It shows personality, which a lot of the DCUC figures were lacking. He even wears his hat at a rakish angle. Thankfully, none of the joints are stuck or broken - nothing worse than an exclusive that falls apart in your hands. The thigh swivels were tough to get moving, but they went without any freezer time or extra work; basically, just muscle to free them up. 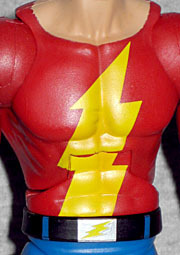 The figure's design is the modern version, with the lightning bolt coming out of his waist instead of just ending on his chest. He has another lightning bolt on his belt buckle, and his red is dark enough that it doesn't look plasticky. The only bad thing about this figure is the helmet - it's vac-metallized. Bleh. Vac-metallized toys never look good! Yes, he wears a metal helmet, but it's not polished chrome or anything. Probably steel, given its origin (it was his father's helmet from WWI). A nice light gray or silver would have been preferable. The wings are gold, but they're not metallized and they look fine, right? Why couldn't the body be the same? There's a big obvious seam running right down the center, too. The hat is permanently attached to the figure's head, so no using it as a projectile. Until this figure came in the mail and I opened the box, I had no clue what the packaging was going to look like. Turns out it's a lot like DC Direct's "First Appearance" packaging. It's a blue trapezoid with an orange insert and a very large window to allow you to see the figure well. Clearly Mattel is embracing the fact that this is a collector line by copying the work of previous collector lines. Our favorite feature, though, is the portrait of Jay on the back of the box. How much do we like it? We're bothering to show you a picture of it. The art was done by Mike Thompson, who's also done card art for GI Joe and may be the only human being who's chosen to work in Corel over Photoshop. His work is usually awesome, and Jay continues that streak. Just look at it; he's in a running pose, and has the same kind of smirk the toy has. What's really cool is that his "costume" is clearly made from civilian clothes: a T-shirt rather than spandex; a pair of blue jeans complete with pockets, rivets, a fly and belt loops; and shoes that have real laces and straps above the ankle. This is a man who put together a costume out of clothes he had at home, not fancy space-age materials. It's seriously lovely art, and almost enough to make it worth keeping the packaging. Mattel asking fans to sign on to the "Club Infinite Earths" was a gamble - not for them, because if they didn't get enough people they wouldn't go forward, but for us. There was no guarantee the character selection would be good, or that the QC (a noteable chronic problem with Mattel) would be okay. But I like 6" superhero toys, and if these characters were being sold in stores I would have wanted them, right? Well, blindly jumping into the sub worked out so far, because the Flash is a cool figure, and I'm happy to have him.